Welcome to the E.A.D. Designs weekly Monday hop! You should have arrived at my blog from Amy T.'s blog, if not, please start the hop at the E.A.D. Designs blog! (The hop officially begins today at 10:00 a.m. EST). My card for today uses the E.A.D. Designs Monster Birthday Stickerz! This set is so stinkin cute for kids birthday cards (and big kids too)! Extra products used: SU cs, Imaginance dp, BG fiber and u/k button embellishment. Don't forget to leave a comment on each stop on the hop, including the E.A.D. Designs blog to be entered into a random drawing for an E.A.D. prize from one of the DT's blogs! This turned out so cute! I love the polka dot paper and that crazy little monster. TFS! what a fun card! love the monsters! Love all the color! It's definitely fun for big kids too! This is such a cute card!! I love it!! Super job! The monster is adorable! Funny, after planning my girls' birthday parties, I usually look JUST like that monster :) Ha! This card is just too fun! The colourful polka dots and monster go so well together. Great card! Very fun card for a birthday! Your card is so cute!! I love that paper and the cute little monsters. He is so cute and the sentiment is perfect! I love it! 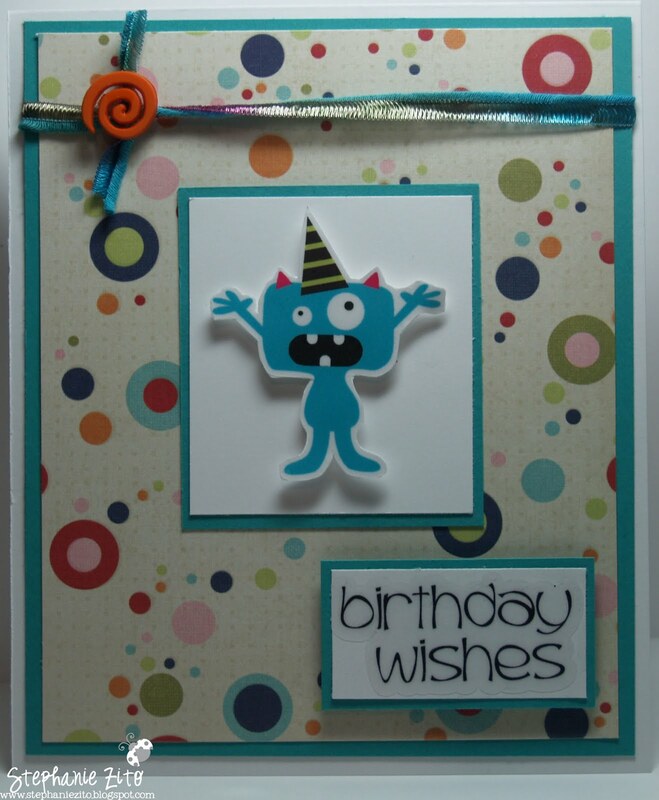 Perfect for people who are birthday-phobic...I have a few friends who would appreciate it! Love the layout and the colours too! LOL! I totally feel like your cute blue monster! Adorable card. Love your card. I especially love your background paper. What a great choice to show off your little monster. Thanks for your time and talent.